With colourful paintings adorning the walls, Persian rugs carpeting the floor, the scent of incense wafting through the air and Billy Holiday crooning in the background, Envision Optical Designs in Vancouver’s trendy Kitsilano neighborhood offers a feast for the senses. Owner Monny Nahoum’s store is a great place to find the latest in designer frames from Europe, Asia and North America. It is also an excellent example of sensory marketing in action. Sensory marketing, whereby multiple senses are stimulated in order to heighten a product’s appeal, is an increasingly popular technique for enhancing consumer experience. Many well-known companies have leapt aboard the sensory marketing bandwagon: Singapore Airlines has a signature scent which makes frequent flyers feel more at home and enhances their flying experience; Starbucks has soundtracks to complement the smell and flavour of its coffee; and Westin Hotels and Resorts feature warm lighting, beautiful botanical arrangements, signature music and scents, all designed to create an emotional connection with guests. Traditionally, most marketing efforts were directed at the eyes and ears, while the other senses were largely neglected. Today, with the competition for consumers’ attention so intense, there’s a growing belief that no sense should be left unstimulated. “Whether it is the colours one sees, the packaging one opens or the music in the store, each experience draws, engages, and leaves behind an indelible trace,” says Aradhna Krishna, professor of marketing at the Ross School of Business, University of Michigan, and author of Customer Sense: How the 5 Senses Influence Buying Behavior (Palgrave Macmillan, 2013). At a time when online eyewear dispensing poses a significant challenge to bricks and mortar dispensers, sensory marketing offers the latter a valuable opportunity to distinguish themselves by creating truly memorable in-store shopping experiences. They’re willing to pay for it, too: 86 per cent of consumers surveyed for the report said they would pay more for a better customer experience. 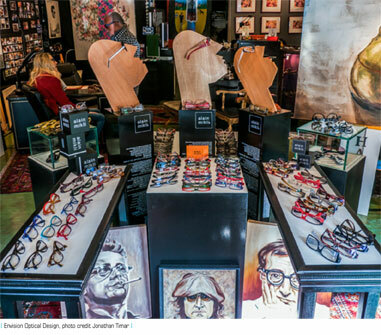 Nahoum, who was a fashion photographer and style consultant, before opening Envision Optical Designs in 1988, says his store’s sensory elements help to create a warm, inviting atmosphere, which his customers savour. Everything – from the lavender and geranium incense to the lush jazz soundtrack to the paintings by talented local artists – is designed to contribute to a stimulating and enjoyable shopping experience for his customers. The atmosphere at the 165 IRIS eyecare locations across Canada is also designed to put customers at ease so staff can discuss their needs and determine which products will best fill them. Angle says the company tries to engage the senses as a way to enhance the customer experience from the first contact right through the fitting process. In the long term, IRIS believes its approach will result in a higher average customer purchase. 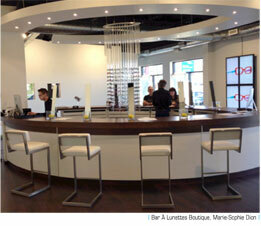 Marie-Sophie Dion has created a unique minimalist experience for customers who visit her four Bar à Lunettes locations in Quebec. The walls are white and each room is large and airy, with ultra-high ceilings and curved walls. Large windows admit plenty of natural light, and big LED spots on the ceiling direct a “natural” light colour onto the walls, creating a reflection and brightening the room. Dark wooden floors add warmth to the decor. Acrylic rods suspended from the ceiling showcase frames and sunglasses. In the centre of the showroom is the bar, with dark wood counters and 10 stools made of white leather and stainless steel. Three optical businesses – three different approaches to sensory marketing – and each as unique as the clientele they are designed to attract. The lesson is simple – appealing to the senses pays off. How do you stack up? Point-of-purchase materials (POP) play an important role in creating a stimulating sensory environment for consumers. Appealing window treatments draw people into your optical store, while attractive display systems, pleasing images and engaging educational tools all contribute to making it a memorable experience. “POP is an excellent way to attract, educate and inform consumers,” says Glen Eisenberg, president of Montreal-based Precision Advertising, whose clients include WestGroupe and IRIS, the Visual Group. In general, POP enhances the presence of a brand or product line, says Eisenberg. The challenge is ensuring that the messaging is relevant to consumers and communicating it in a way that resonates with them. Many manufacturers are developing innovative POP displays, including window units that help to create an interesting merchandising story, says Eisenberg. For all of the WestGroupe brands, Precision Advertising has developed a suite of materials, including banners, counter cards and ancillary products, which sales reps can use to create such a story, either in windows or inside the store. IRIS, the Visual Group uses LCD screens to explain the features of its digital lens products to customers, says Dr. Daryan Angle, vice-president of professional relations. Transitions Optical’s Marketing Manager Isabelle Tremblay-Dawson believes that it’s more important than ever for optical customers to have the best possible shopping experience, since those who do are more likely to recommend the store to family and friends and to return themselves. “We need to differentiate our brands based on the customer experience, as well as the products we’re selling,” she says. To facilitate that, Transitions offers a wide range of POP materials and patient education tools that demonstrate the benefits of its products. For instance, the company provides clients with UV demo light units and lens cards, which demonstrate the benefits of photochromic technology in-office. Other POP materials include window clings that tie into the look and feel of Transitons’ “Life Well Lit” ad campaign. “They help patients make the connection between our mass media campaign and the product in-store,” says Tremblay-Dawson. Tura, Inc. reflects the quirky, playful nature of the Ted Baker Eyewear and LuLu Guinness eyewear brands with dynamic POP, says Marketing Director Lidia Parisi. Ted Baker is positioned as a brand with attitude, appealing to a broad target audience of men and women, both young and the young at heart. Its “out of the ordinary” philosophy is reflected in the POP, which includes a small suitcase and trunks that are, “very quirky, just like Ted Baker,” says Parisi. The iconic image of LuLu Guinness is a large pair of red lips, which reflects the designer’s individual style and glamour. The red lips are incorporated in a three-piece display and logo ID for the brand. Sàfilo’s POP reflects the company’s position as the purveyor of exclusive luxury brands and helps to create a positive first impression of optical stores that carry them, says Wendy Bertrand, the company’s Toronto-based in-store visual merchandising specialist. “Our products, their packaging and the store environment all reflect that position,” she says. Paco Underhill is president of New York-based Envirosell, an international marketing company that specializes in analyzing the interaction between people and products in commercial spaces. Underhill, who has worked with optical retailers around the world, including Canada, is also the author of Why We Buy: The Science of Shopping (by Simon and Schuster, 1999). Lighting is among the easiest and cheapest ways to improve the quality of the customer experience, he says. Pay attention to the quality of the lighting and match the colour “temperature” to the environment and your customer mix: generally, the more pink-skinned your clients, the warmer the lighting should be, and the more olive-skinned they are, the cooler it should be. “It’s a matter of making people look as good as possible while they’re wearing your frames,” he says. Having patients try on frames of different weights is one way to involve their feeling sense, says Underhill. Another is to physically adjust the glasses on the patient’s face. There are two elements to this. The first is to eliminate unpleasant sounds. Carpeting can help to absorb sound in a noisy showroom and white noise units also absorb noise and contribute to a peaceful atmosphere. This can be important in an optical setting where machines are operated, notes Underhill. “You may be oblivious to it but others will notice,” he says. You can appeal to your customers’ sense of taste by offering them tea, coffee or a soft drink as part of the welcome process. This helps to put people at ease and gets them talking about their work, lifestyle, etc., all of which has a bearing on their vision needs and challenges. “When the saliva glands are working, the wallet is looser,” says Underhill.